From the discovery of the ruins of a fictional planet in the middle of nowhere to the enigmatic pursuit of an albino penguin on a faraway island, Simultaneous Worlds: Global Science Fiction Cinema is filled with many astounding stories and anecdotes. These making-of stories often "blur the boundaries between reality and fiction, and between history and science fiction." 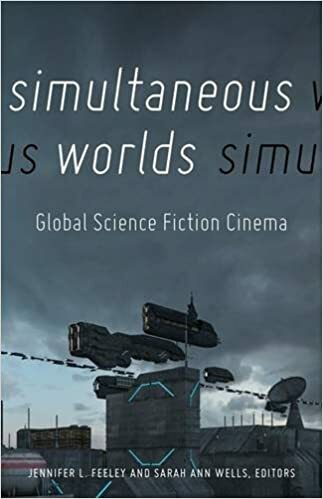 What emerges finally is a series of "hauntingly evocative and temporally perplexing" snapshots of science fiction movies from around the globe that meld "past and future in a nostalgic and surrealistic amalgam" (p. 85). Not bad for a book which claims to "challenge the notion of SF as a primarily Hollywood, even Western, genre" (p. xi). In "Media and Messages," Nathaniel Isaacson reasons how the non-English speaking world came to view "science"—even "cinema" to a large extent—as Western inventions and modes of creative expression. Prevailing understandings of "modernity" during the late Qing Dynasty (1644-1911) in China were "firmly rooted in a Weberian/Marxist model that privileges the development of European institutions and economic systems as a teleological standard" (p. 274). These associations spilled over when the term was translated into Japanese and then to Chinese. Similar transactions occurred in the many regional languages of the world, where "to be scientific was to be modern and western." Therefore, the English language remains the key to leading journals of science today; it is also the default subtitling language of the many flavors of world cinema. More often than not, the many drafts as well as shooting scripts of "regional" or "world" language movies are also written in English with the local sounds of their native tongues barely hinted at in Roman. Our understanding of what is Western and what is not, then, is a matter of a historical perspective—of which part of the English-language globe you claim to be yours, and nostalgia even for the eroding native, racial, or ethnic quirks. Hollywood productions like Prometheus (Ridley Scott, 2012) and the Tom Cruise-starring Oblivion (Joseph Kosinski, 2013) are cited as examples of how local workers and locales are employed by global capital which suits up, talks, and walks in global English. Both Prometheus and Oblivion "participate in an emerging trend of using Iceland to represent unearthly, primordial, and fantastical settings," Hye Jean Chung writes in her essay, "Media Heterotopias and Science Fiction" (p. 86). Simon Schama’s observation from Landscape and Memory (1995) is spot on: "Landscapes are cultures before they are nature." These two films are as much the product of a global capitalist venture as they are "constructs of imagination projected onto wood and water and rock" (p. 86). Still, the real Icelandic landscape—inhabited by people who worked on these American productions—exists simultaneously, and somewhat independently of Hollywood’s aesthetic and rhetorical constructs. Chung doesn’t say it loud, but her essay makes it clear that we can’t think about Hollywood films simply as American. Both Prometheus and Oblivion are products of a larger, global collaboration. Just look at the terrestrial residues of Iceland’s virtual masquerade in these films, Chung says, as their imaginary landscapes are grounded upon material realities of the real world. Film landscapes are more than "narrative backgrounds" or "spectacular settings," Mauria Natali said. And Chung through Natali stresses "their ideological power and material presence beyond the screen." Most of the science fiction films examined in Simultaneous Worlds are either a critique of or a response to America’s "Manifest Destiny," whether it is Spanish-Cuban zombie comedy Juan the Dead (Alejandro Brugués, 2012), Mexican technological nightmare Sleep Dealer (Alex Rivera, 2008), or Chinese lab film Death Ray on a Coral Island (Hongmei Zhang, 1980). Japanese anime Ghost In the Shell 2: Innocence (Mamoru Oshii, 2004) and North Korean Godzilla film Pulgasari (Shin Sang-ok and Chong Gon Jo, 1985) also seem to be in a dialog with "Western" philosophy, science, and cinema. Perhaps that’s why the main premise of the book didn’t sit right with me. Stanley Kubrick’s 2001: A Space Odyssey (1968) is often hailed as one of the greatest films of all time, and Andrei Tarkovsky’s Solaris (1972) is a widely celebrated masterpiece. I don’t think these two directors saw themselves as science fiction auteurs, or their films as "science fiction cinema." Most writers of science fiction don’t see themselves as genre writers—it’s same with filmmakers. Before the era of top ten listicles, marketing labels and the best-of-genre trailers, these films were seen and circulated within the cinephile world as examples of "great (art) films," not "great science fiction films." Most cinephiles would have serious problems with the label of "science fiction" when applied to 2001: A Space Odyssey and Solaris. I likewise found it difficult to think of the Argentine "retro-futurist" film The Aerial (Esteban Sapir, 2007) and the Soviet "sci-fi dystopian black comedy cult" film Kin-dza-dza! (Georgiy Daneliya, 1986), both also mentioned in the book, as science fiction films. Steve Choe’s brilliant essay on Park Chan-wook’s romantic comedy I’m a Cyborg, But That’s OK (2006) didn’t convince me that the film is science fiction (p. 210). I do appreciate and find the academic ruminations useful, yes; these films provide a sense of cognitive estrangement and draw from many genre conventions, sure. But so do Ingmar Bergman’s Persona (1966), László Nemes’ Son of Saul (2015) and most of Werner Herzog as far as I’m concerned. The attempts to ghettoize cinema doesn’t feel right. If anything, when I was in film school, Solaris and 2001: A Space Odyssey were our achievements—no matter where one lived, or what dialect of a language one spoke, or what color of trousers one wore. In a world broken into many languages, English is the lingua franca, our Rosetta stone which connects people and brings nations together. That explains why English language films rule the box office. However, the success of a film wasn’t always tied to the sound or language of the film. Charlie Chaplin didn’t need the crutch of sound, neither did Fritz Lang or F. W. Murnau. Film is its own language. Cinema unites and speaks to a worldwide audience through its own grammar, its visual codes and syntax. No wonder J. P. Telotte’s essay, "F.P.1 and the Language of a Global Science Fiction Cinema," reads like a cautionary tale. The multilingual production of Kurt Siodmak’s novel F.P.1. Does Not Answer (1932) seems ridiculous. The film was basically shot in three languages with slightly "localized" scripts and name actors for each of the three different target countries: Germany, England, and France. In a book which aims to challenge our rusty views, Telotte’s essay puts its fingers on the heart of the problem with a project like Simultaneous Worlds. The case of F.P.1 suggests that any attempt to make a truly universal—global, crossover—film is bound to fail. The complete text of a film can be fully understood only by the people living and breathing the imagined landscape of the film. The subtleties, quirks and peculiarities of human cultures are dependent on time, geography and custom of a people, who shape and are being shaped by these very forces. Isn’t it true for most art forms? For example: Beethoven, Bharata Natyam, or The Brief Wondrous Life of Oscar Wao (2007)? Film remains a ubiquitous medium. In their noble attempt to rescue science fiction from Hollywood and make it "global," the scholars and teachers of Asian and Latin American cinema, high on their "Visions of the Future," have ended up charting a familiar terrain. Only the films they have chosen as their guides happen to be interesting and different—they happen to be what the gurus and nerds could term as sci-fi movies through "encounters with other theories and traditions of the genre’s production" (p. x). The basic premise is part a marketing gimmick akin to the "Destroy Science Fiction" franchise and part a welcome addition to the existing film scholarship; it works because their hearts are definitely in the right place. Oftentimes these travelers’ yarns are better than their guides. And therein lies the joy and thrill of encountering Simultaneous Worlds for a student of science fiction and cinema. Salik Shah is a world citizen who grew up in Kathmandu and New Delhi. He likes to read, write and film. You can find him on Twitter at @salik.